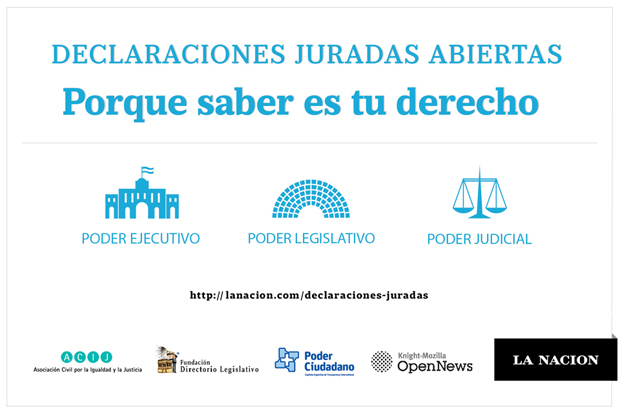 In Argentina, where we don´t have an access to information law yet, LA NACION and other three NGO´s that work towards transparency (Poder Ciudadano, ACIJ and Fundación Directorio Legislativo) worked together to develop the first site concerning the heritage of public servants, making the information accessible to anyone with a computer and an Internet connection. The work included more than 30 volunteers manually entering data and generating a structured and searchable dataset from scanned PDFs. The project included all of LA NACION DATA team, using collaborative tools, coordinating cross checking procesess and 6 full day check-a-thons that included the volunteers. As they assume their public duties, public officials in Argentina, are required to fill out a statement declaring their assets and then they are asked to update that information every year, while they’re in office. Even though the records are public, the information was not easily accessible to ordinary citizens, and of course when asked, it were given in print copies. Declaraciones Juradas Abiertas was born in a unique political scenario. A new law regulating public officials’ affidavits was passed, which omits asset information of the children and spouses of public officials in future affidavits, reducing the amount of information previously available. The family asset situation is vital to create a chart of the current patrimony of a public servant for an illicit gain investigation. The application, which was launched on Sept. 28 (International Right To Know Day) includes 1540 affidavits from more than 800 public officials (the members of President Cristina Fernández’s cabinet of ministers, legislators and judges, among others). It contains detailed information about their financial assets and properties over the years. The interactive application that allows users to read a large volume of information and do comparisons, with an easy visual interface, includes the possibility to explore every original PDF document in detail, using DocumentCloud. After the requests of the statements of assets was made to the Anticorruption Office (OA) and other offices, all the information came in print and in boxes. Each file was around 5/7 pages long. The priority was given to the affidavits of the most relevant seats of each power and to the candidates for october 2013 legislative elections. The data had to be typed manually on spreadsheets and the original affidavits had to be scanned, previously erasing sensitive personal data and uploading the information to DocumentCloud were each annual public servant affidavit was linked to the original project. We planned a schedule to load, check and normalize data. During four months we paid particular attention to the verification of the data, which was checked after entered, after processed and, finally, in the web application. Three times in total. More than 30 volunteers were in charge of manually typing and checking each affidavit, during working days which we baptized “Chequeatones”. It was a very hard task, and to make it easier we gave symbolic gifts and candys or Starbucks vouchers to those who found more errors and checked more documents. This is an example of what it was like to type the data from a paper application form and how it ended up looking in the interactive application. 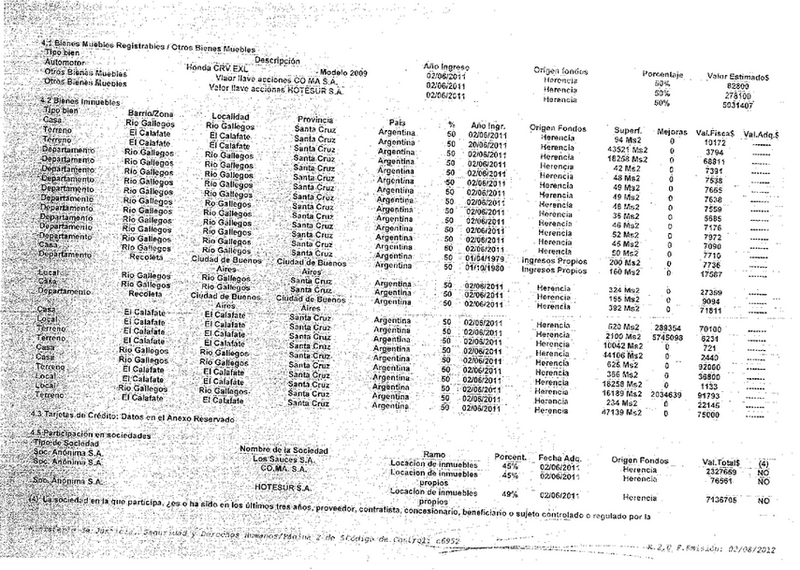 It was taken from president´s Cristina Elisabet Fernandez de Kirchner annual affidavit. - The delays and formal denials from the Public Administration to deliver the affidavits. - The fact that they were delivered on paper copies. - The various affidavit formats available, which differed from one branch (executive, judicial and legislative) to another. - The different valuations of the assets (tax valuation, purchase valuation, improvements, etc). - There were no standards in relation to the way shared assets are published. To develop this project we worked collaboratively on Google Drive (Google Docs and Spreadsheets) and Trello. Also with Excel for data analysis. History and Impact: After the first two interactive visualizations, our President announced during the opening of the Annual Sessions of Congress 2013 that her government would promote a national law regarding asset declarations for all public servants. (*) Unfortunately, as stated above, the new law regulating public officials’ affidavits passed, omits asset information of the children and spouses of public officials in future affidavits, reducing the amount of information previously available. This gives more value to the effort of opening the open assets declarations prior to 2013 for future research. After the launch of our application, Anticorruption Office Site published the public official affidavits online but the information are in total amounts per category (e.g. it doesn´t discriminate number & location of properties, names of companies where conflict of interests could arise, etc.) And still, it doesn’t offer the information in open formats. 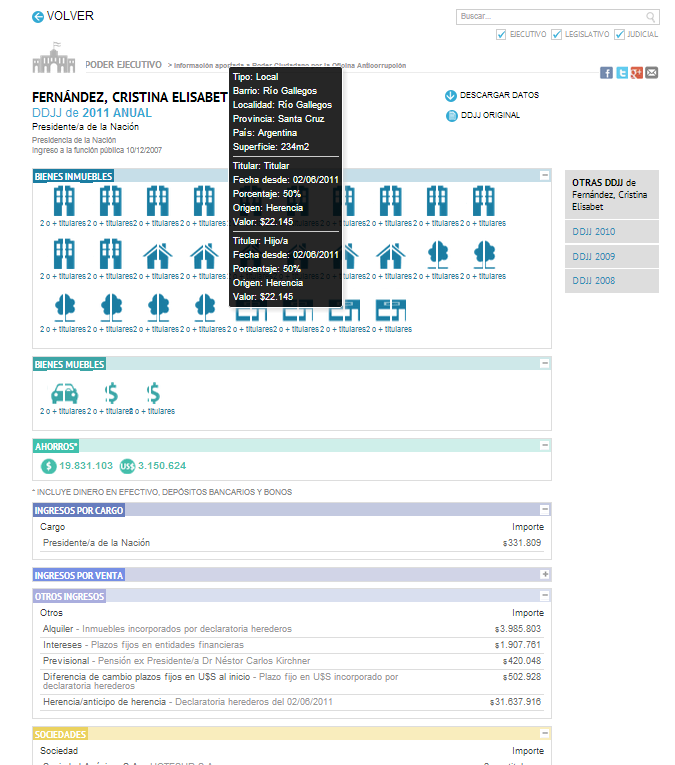 Esta entrada fue publicada en DATA, ENGLISH, Statements of Assets por abcd.